Attention:The gas tank does not includes in this item! 1.It is applied to outdoor camping, picnic,fishing,self-drive and other outdoor activities. 2.It is small in fuel consumption,only about 6g/h. 3.Easy to carry,mini size,ultralight and portable. 4.Adjustable fire,turn right, fire stronger;turn left, fire softer. 5.One-piece candle lamp: space-efficient and convenient. 6.Delivers bright, reliable and consistent light for any outdoor gathering,fueled with efficient butane gas, provide you a steady,power and strong firepower. 7.High performance material: constructed with strong and heavy-duty copper,aluminum alloy,rubber,glass and stainless steel,corrosion-resistant,durable. 1.Forbidden to use in any enclosed environment,or it may cause carbon monoxide poisoning. 2.It will be high temperature when and after using it,please pay attention to avoid being scalded. 3.Never use in direct sunlight or other high-temperature environment. 4.If the fuel leak is found,instantly stop usage. 5.Children are prohibited from using. Heat resistant and windproof:Toughened glass lamp globe is light and durable and it is equipped with and easy lighting-up tuyere for practical to use. Adjust the brightness as you need: adjust light level from to high with adjusting the glass globe clockwise and anticlockwise. 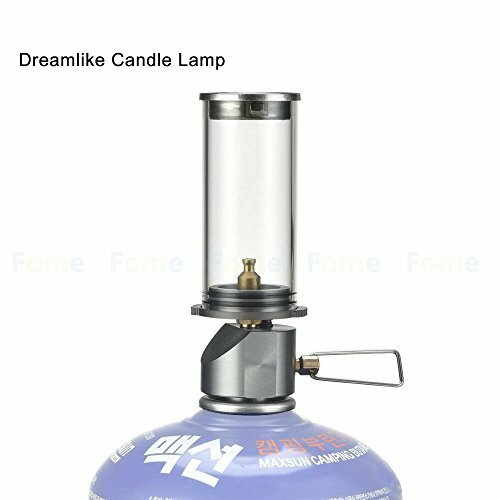 Features: Easy to carry,mini size,ultralight and portable.Mini design with a foldable valve and storing box, hand carry case lantern during transport and storage.One-piece candle lamp: Space-efficient and convenient. If you have any questions about this product by FOME SPORTS|OUTDOORS, contact us by completing and submitting the form below. If you are looking for a specif part number, please include it with your message.